Greg McLean’s Wolf Creek TV show has been picked up for season two on Pop. The cable channel announced they’ve purchased the second season of the Australian horror series today, as part of it new programming slate. Based on the cult horror film of the same name, Wolf Creek season two will premiere on Pop in 2018. Jon Jarratt will return as terrifying serial killer Mick Taylor. 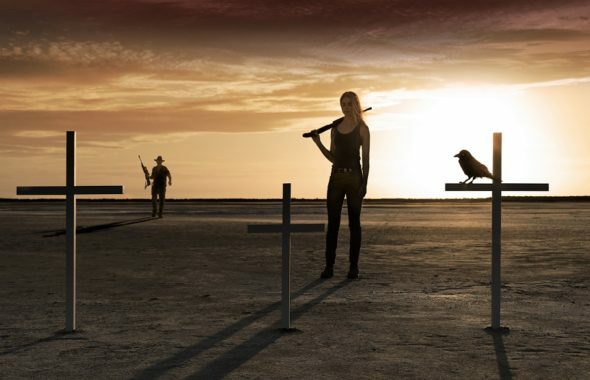 Wolf Creek also stars Lucy Fry as Eve Thorogood and Dustin Clare as Sullivan Hill. The cast includes Andy McPhee, Damian de Montemas, and Jessica Tovey. Here’s more on Wolf Creek from an earlier Pop press release. In conjunction with Lionsgate Television and Zodiak Rights (a Banijay Group company), the WOLF CREEK television series on Pop stars John Jarratt, who reprises his movie role as the murdering psychopath Mick Taylor, wreaking havoc in the Australian Outback – except this time, things are different. The television series immediately turns the entire genre on its head when a 19-year-old American college student, played by rising star Lucy Fry, survives the massacre of her parents and little brother and sets out to hunt down the killer and avenge her family. What do you think? Are you a fan of the Wolf Creek TV series? Do you plan to check out season two on Pop? Let us know, below. More about: Pop TV shows: canceled or renewed?, Wolf Creek, Wolf Creek: canceled or renewed? The series did not show as scheduled …what happened??? When will it show again? Yes,yes,yes season 1 of wolfcreek was awesome and surely cannot wait to watch season 2. Thank you Pop for bringing the series back! This show is horror at it’s very scariest best. Look forward to season 2. Just to correct the article. Pop have bought the US rights to Wolf Creek Season 2. They did not commission it. Stan the Australian Netflix did that. Season 2 started production in July 2017.